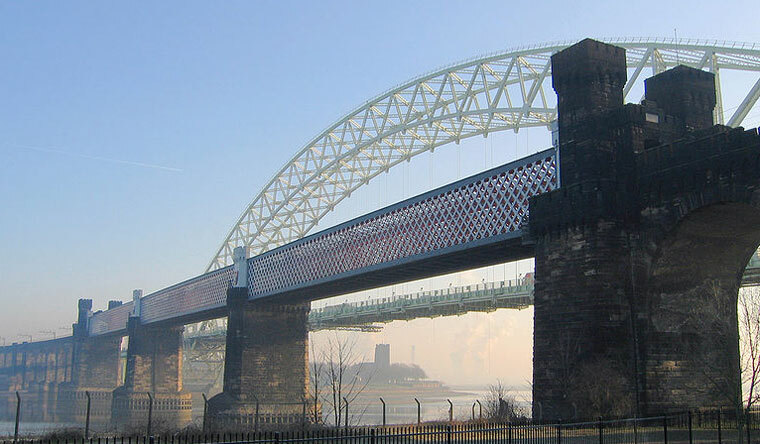 The Runcorn Railway Bridge, which is also known as the Ethelfleda Bridge or the Britannia Bridge, crosses the River Mersey at Runcorn Gap from Runcorn to Widnes in Cheshire, England. It was built for the London and North Western Railway (LNWR) to a design by William Baker, chief engineer of the railway company. It is a Grade II* listed building. Contractors were Brassey and Ogilvie; Cochrane and Co supplied the girders. In 1846 the Grand Junction Railway Company obtained an Act of Parliament to build a bridge to cross Runcorn Gap. A time limit of 7 years was imposed. Shortly after obtaining the Act the Company amalgamated with others to form the London and North Western Railway. Other projects took precedence, the 7 years time limit passed, and so the powers to build the bridge lapsed. In 1861 Parliamentary approval for a bridge was obtained by the LNWR. Preparatory work commenced in 1863 and the first stone was laid in 1864. The bridge was completed by 1868 and on 21 May there was an introductory opening when the contractor's locomotive Cheshire drew 20 wagons over the bridge. It was formally opened for traffic on 10 October. The first goods traffic crossed it on 1 February 1869 and the first passenger train crossed on 1 April of that year. In the early 1890s the Manchester Ship Canal was built, passing under the bridge. The footway was closed in 1965. 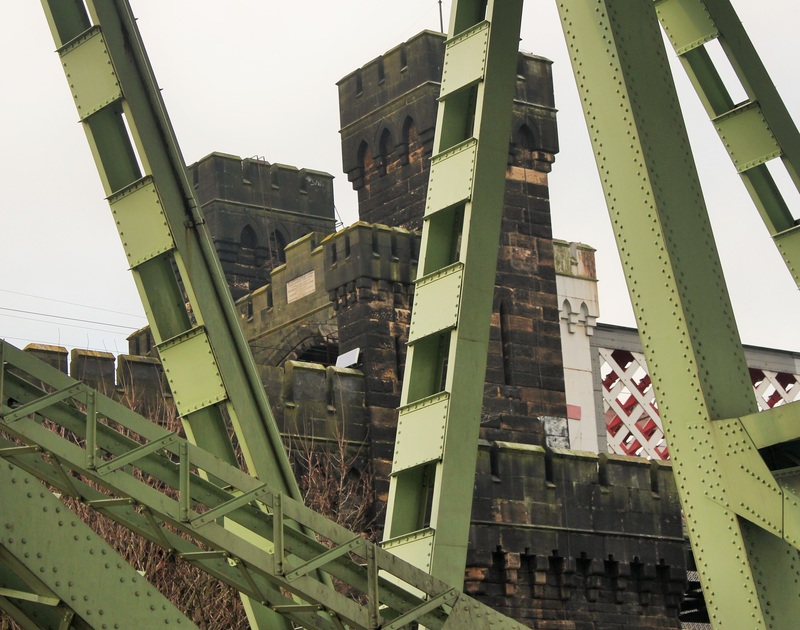 The bridge is still in use today for rail traffic on the Liverpool branch of the West Coast Main Line. The bridge consists of three wrought iron spans of 305 feet, each on two sandstone abutments with foundations at a depth of about 45 feet below water level. The erection of the lattice girder spans was unusual, because instead of floating them down the river and lifting into position, each was built up piece by piece in situ. The bridge carries a double line of tracks. As the structure superseded a centuries-old ferry, a footbridge alongside the main girders was provided on its eastern side. There is a clearance of 75 feet above the high water mark that allowed sailing ships to pass beneath it. There are 6 lattice girders, two to each span. Each girder contains 700 tons of iron and is fastened by 48,115 rivets. From the north side of the river the bridge is approached by a viaduct of 49 arches, then a short piece of embankment, followed by 16 more arches. From the south it is approached by a viaduct of 33 arches. On its completion, the bridge was the longest of its time. The "official" name of the bridge in uncertain. Locally it has been called the Ethelfleda Bridge but more widely as the Britannia Bridge. The bridge is named after Ethelfleda because the southern abutments and pier were built on the site of the Saxon burh erected by her in 915. 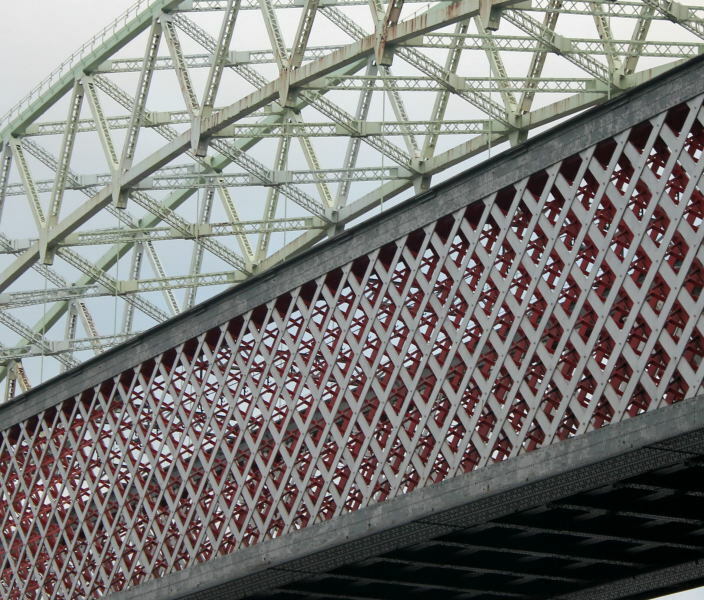 Parts of the bridge are castellated to reflect this. There are three shields above the footway showing, from the southern end, the Coat of Arms of the City of London, Britannia (from the crest of the railway company) and the Liver Bird of Liverpool. 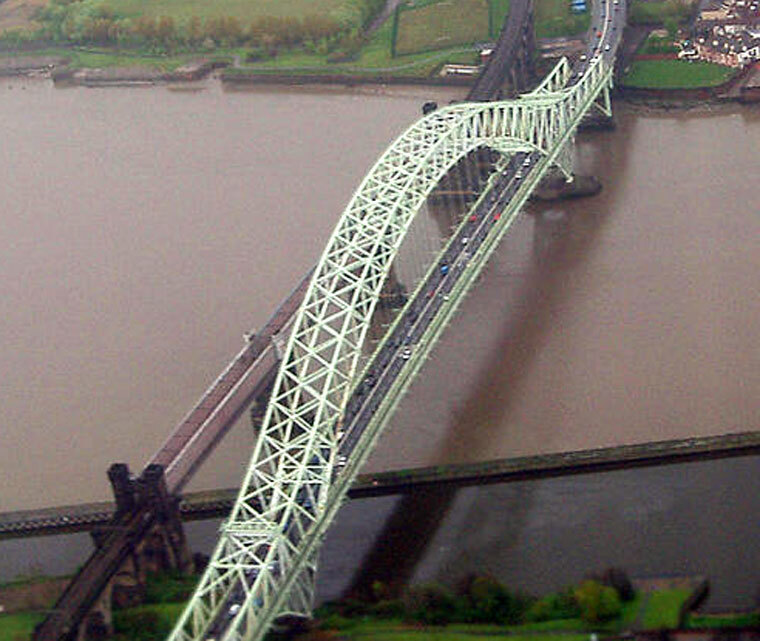 Because of the crest the bridge is also known as the Britannia Railway Bridge. This page was last edited on 8 February 2018, at 20:40.